These real-life fairytale castles will instantly transport you to a magical world. You can cruise to some of the most picturesque travel destinations in the world and visit these breathtaking architectural masterpieces. Gamlehaugen is the royal residence of Bergen, where the Norwegian royals reside when they visit the picturesque town. It was built in 1901 in the style of a Scottish castle, and the royal family acquired the property in 1927. Parts of the castle are open to the public, as well as the surrounding Gardens of Gamlehaugen. Browse cruises to Bergen, Norway. This historic fortress may be Edinburgh’s most iconic landmark, thanks to its towering position on Castle Rock. Archaeologists have determined that human occupation on Castle Rock dates back to the 2nd century AD, and a royal castle has existed in the prominent location since the 12th century. Some aspects of the Edinburgh Castle were added in the 1500s. Researchers believe the castle has undergone 26 sieges in its 1100-year history, making it one of the most attacked places not just in the United Kingdom but in the world. Browse cruises to Leith (Edinburgh), Scotland. Portovenere’s Doria Castle was built by the Genoese in 1161 and overlooks the scenic Poet’s Gulf. It dominates the small village and was an important frontline citadel during Genoa’s war with Pisa. During the time of Napoleon’s rule, the castle was used as a political prison. Though years of battle have taken a toll on the castle, it has been frequently restored. Today it is a popular tourist attraction and event venue. Browse cruises to Portovenere, Italy. Cawdor Castle in Nairn, Scotland. This medieval Highlands castle is famous for its connection to Shakespeare’s Macbeth – although the 11th-century events on which the play is based occurred years before the castle was built. Cawdor Castle is impressive inside and out. Its three gardens are immaculate, and its well-maintained interior offers a fascinating look at Scottish history. Browse cruises to Invergordon, Scotland. Alanya Castle sits high on a rocky peninsula is in the southern Turkish city of Alanya. It’s protected on three sides by the Mediterranean Sea. The castle was built in the 13th century under the Seljuq Empire Sultanate of Rûm. During Ottoman Empire times, the castle was no longer purely defensive. In the 19th century, villas were built within its walls. Today it is an open-air museum and is awaiting UNESCO Heritage status. Of all Scotland’s castles, Culzean Castle is one of the most popular with visitors. It’s dramatic location, perched on an Ayrshire cliff top and surrounded by beautiful gardens, gives the castle an air of grandeur. Built in the late 1500s, the castle was originally an unremarkable fortress. The castle was renovated in the late 1700s by famed architect Robert Adam and transformed into a renowned masterpiece of architecture. Azamara guests calling on Glasgow can experience the castle and its history in a unique way on the “Culzean Castle Upstairs Downstairs” Azamara Shore Excursions tour. This experience provides insights into the lives of the noble families and hardworking servants who resided in the castle. 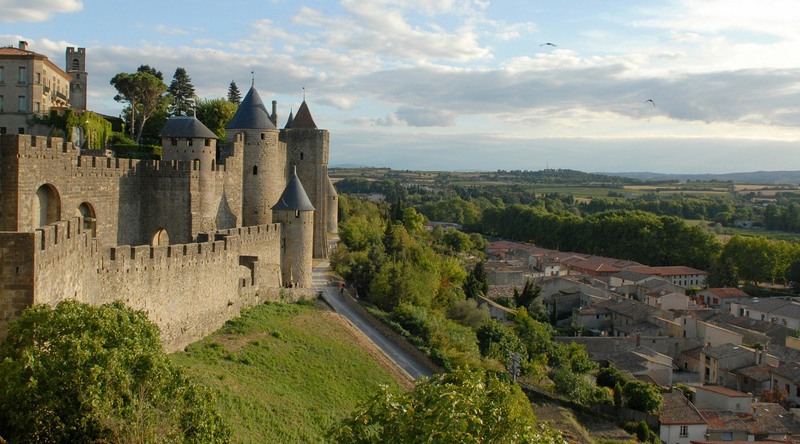 The massive citadel known as Cité de Carcassonne sits atop a hill on the right bank of the River Aude in Carcassonne. It dominates the city with its impressive three kilometers of walls and 52 towers. Cité de Carcassonne is more than just a castle. In the 3rd century, Romans transformed the area into a fortified city. In 1849, the French government proposed demolishing the fortifications but were met with opposition from local people and historians. The government reversed its decision and a lengthy restoration process ensued. In 1997, Cité de Carcassonne became a UNESCO World Heritage Site. Browse cruises to nearby Port Vendres, France. Windsor Castle may be the most famous castle in the world. It is also the largest and oldest occupied castle in the world. Windsor Castle has been a family home to British kings ad queens for over one thousand years. The original Windsor Castle was built in the 11th century. Inside the castle walls, is the 15th century St. George’s Chapel and the 19th century State Apartments. The chapel is known as one of the most beautiful buildings in all of England. Queen Elizabeth II spends many of her weekends at this royal residence. When visiting, look at the flag flying from the Round Tower. A Royal Standard flag indicates Her Majesty’s presence. Browse cruises to Southampton, England. This hilltop complex is made up of 83 buildings considered the best surviving example of Japanese castle architecture. Himeji Castle has a history that dates back to 1333 and has been remodeled many times. It has remained intact in its current form for over 400 years, surviving bombings and an earthquake. Himeji Castle is also sometimes referred to as Hakuro-jō (White Egret Castle) or Shirasagi-jō (White Heron Castle) as the white exterior resembles a bird taking flight. Castle Ward is known for its interesting mix of Gothic and Classical styles. That eclectic trait is the result of the differing tastes of its owners, Lord Bangor and Lady Ann Bligh. The 18th century National Trust property is open to the public and sits on 820 acres of beautifully landscaped grounds. The castle is also known for being a filming location for the HBO series Game of Thrones. In fact, Azamara guests calling on Belfast can enjoy a unique experience at this castle through our Cruise Global, Meet Local series tour, “Live Like a Stark at Winterfell”. The tour includes an inside look at how the television show is filmed, the chance to interact with the “Direwolves” that live in the local village, and a medieval banquet! Browse cruises to Belfast, Northern Ireland. Mont Saint-Michel is a small island only a kilometer off the coast of Normandy, France. During low tides, mudflats surround the island. The fortified island is populated – 44 people, as of 2009. The iconic Benedictine Abbey can be reached via a steep, winding street lined with shops, cafes, and museums. The Gothic-style abbey was built between the 11th and 16th centuries and resembles a castle more than a religious site. It’s a UNESCO World Heritage Site and one of France’s most fascinating tourist attractions. Leeds Castle is touted as “the loveliest castle in the world” and indeed, is incredibly beautiful. The castle is surrounded by a beautiful moat and 500 acres of beautifully landscaped parkland. Various incarnations of castles have existed on the property since 1119 and have been rebuilt and renovated over the past 900 years. Today, Leeds Castle mostly dates from the 19th century and its interiors were refurbished in the 1920s and 1930s. The 12th century Malahide Castle resides in a village just fourteen kilometers north of Dublin. Its collection of Irish portraits, period furniture, and stunning walled garden make it a popular tourist attraction. Four rooms are open to the public. The Oak Room, with carved panels depicting religious scenes; the Small and Great Drawing Rooms; and the impressive Great Hall, which features period fireplaces and 16th-century carvings. Egeskov Castle, on the Danish island of Funen, is the best-preserved example of Renaissance water castles. The castle was built in 1554 upon oaked piles in a small, shallow lake. Originally, the only access was via a drawbridge. Political unrest following the Count’s Feud and civil war caused most noble families built fortified homes. In the late 1800s, the castle was restored and converted into a modern farm. Egeskov is still home to a farm today as well as several museums.